Taste of Home $5 Book Sale is Back! Taste of Home is having an amazing sale on books starting today through June 13th. You can get really great selections for only $5 each! I think if I was ever going to be a hoarder, cookbooks would be my downfall. Head over to Taste of Home and check out the selection. Use coupon code LST69 at check out to get free shipping on any $20 purchase. 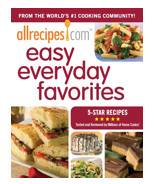 Offers Jun 6, 2011 in books, TasteOfHome · Expired!